Here in this article, we are only going to review the best bed frames that have a proven track record. All 10 bed frames reviewed here surely have secured 1. significant number of reviews, 2. exceptional ratings and 3. remarkable customer satisfaction. There are two version of the same bed frame. One that comes with adjustable head section. You can lift the head section manually to your desired angle. Other version is a standard sturdy frame. 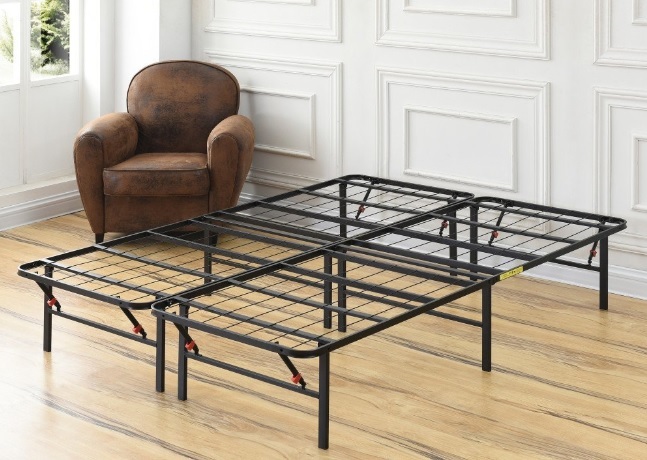 Made from heavy duty durable steel and with a 12 leg setup, Classic Brands bed frame is remarkably sturdy. No matter how heavy or lightweight you are, this bed frame shall never tend to bend or create any annoying creaky sounds as you move in your sleep. Weighing mere 44 lbs and offering the flexibility to fold the frame means it is easy to store and move as and when needed. Compatible with a majority of bed frames, with or without foundation / box spring. Standing at a height of 14 inches above the ground, the bed frame offers sufficient under the bed storage space. The most important factor while selecting a bed frame is the assembly process. And this Classic Brands bed frame is shipped almost assembled. The shipping package size is quite compact in first place. Classic Brands assures 3-Year worry free warranty on this Hercules heavy duty bed frame model. There are nearly a dozen bed frames from Zinus (Sleep Master) on the market, yet this Zinus SmartBase Elite has recorded the highest number of sales along with unmatched customer satisfaction and rating. Made from highly durable and heavy duty steel, each frame can comfortably sustain weights more than 500 lbs. You can directly place the mattress on it without any second thoughts. Weighing 59.5 lbs it is neither too heavy nor too light and Zinus Elite SmartBase too is foldable making it easy to store when not needed. You don’t need an additional frame in first place as the design removes the need to have a box spring or a foundation. You can directly place your mattress on the frame. With 14 inches height, there is ample under the bed storage. Shipped folded and compact, the frame needs no additional tools for assembly. Quick and easy to put it together. This is again one main reason for opting Zinus Elite SmartBase as it comes with 5 Year worry free warranty. Modway Horizon is another best seller with affordable price tag and includes all features of a best bed frame. Might not be on par with Zinus but Modway too has secured significant number of reviews and a decent rating. Made from heavy duty stainless steel, the Horizon frame Modway can comfortably sustain weights up to 1300 lbs. Sticking to heavy duty bed frame design, Modway too has included 12 legs, 6 for each frame in its Horizon model. The two middle legs are purely aimed at sustain and distribute body weight equally across the entire frame. Modway Horizon is foldable in the middle making it easy to store and transport. 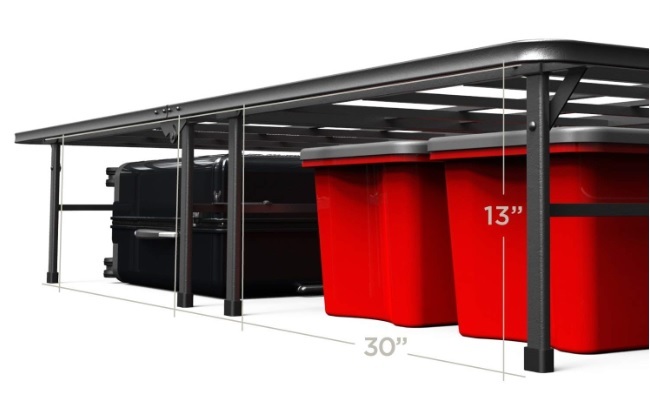 While the shipping weight is around 44 lbs but the item is 40 lbs which is relatively lighter than both Classic Brands and Zinus SmartBase bed frames. You won’t need another box spring or foundation as the Modway frame itself is remarkably sturdy. Made from heavy duty reinforced stainless steel, it removes the need to spend extra on additional box springs or foundations. Compatible with all mattress types – latex, memory foam, innerspring and hybrid mattresses. Modway Horizon too offers 13 inch under the bed storage which is again equal to that of Classic Brand and Zinus SmartBase Elite. As Modway Horizon is foldable in the middle, the shipping comes compact in Size. On the assembly side, it is relatively simple. All you need are a pair of pliers to tighten the wing nuts and bolts. Need to check with the company at the time of purchase. However, the tentative warranty period is 1-Year. Olee Sleep, reputed brand in mattresses segment has significant presence in bed frames category as well. It has multiple models in all sizes and dimensions – 14 inch, 16 inch, 18 inch. Made from heavy duty steel slat, the construction is quite sturdy with 9 legs, the middle 3 legs absorb excess weights. The King size version can easy sustain weights up to 2000 lbs. One notable area is that the frame is not foldable in the middle. This is somewhat offbeat in design yet if space isn’t a constraint then you should not have a problem storing it when not needed. While most other frames are flat on all sides giving a chance for mattress slipping but in case of Olee Sleep, the frame comes with raised bars on top and bottom. This effectively avoids the mattress from slipping or sliding even when you jump around. This raised side bar design eliminates the need to have box springs. Compatible with all mattress types. Yet you need to be careful to have the same mattress size as that of the frame as the frame comes with raised side bars. If the mattress size is larger than the frame size, then there is no chance of fitting the mattress into the frame’s sidebars. This is the biggest advantage with Olee Sleep, it stands at 18 inches height from the ground. Hence, you are left with more than sufficient 16.5 inches under the bed storage space. This is in fact the highest storage space amongst all the bed frames we have in this top 10 review. 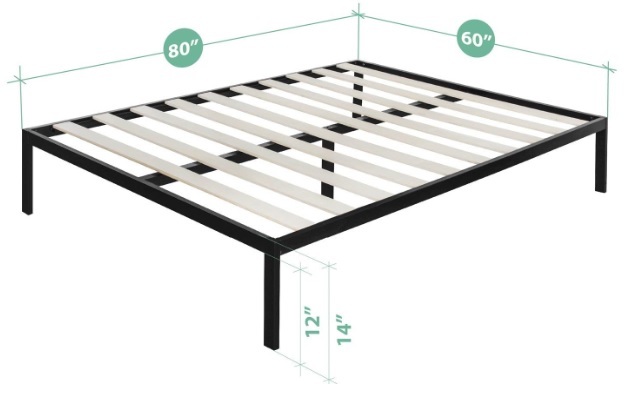 Olee Sleep prior version, T-2000 bed frame model comes with 14 inches height and offers 13 inches under the bed storage, very similar to other regular bed frames. Remember, the frame is not foldable and comes as a single unit. The queen size frame weighs just 49. 27 lbs, which is again neither too heavy nor too light. All you got to do is just fix the 9 leg units to the frame and start using it. It does not have additional brackets or other complex integration stuff. It is simple and easy. The biggest selling point lies with its warranty. Olee Sleep T-3000 comes with 5-Year limited warranty. Best Price bed frame too made the cut into the top 5 best bed frames owing to the remarkable rating and decent number of reviews it secured. Made from 100% steel, the frame is durable for many years. From user feedback, we can draw that Best Price bed frame can comfortably sustain weights up to 2000 lbs. 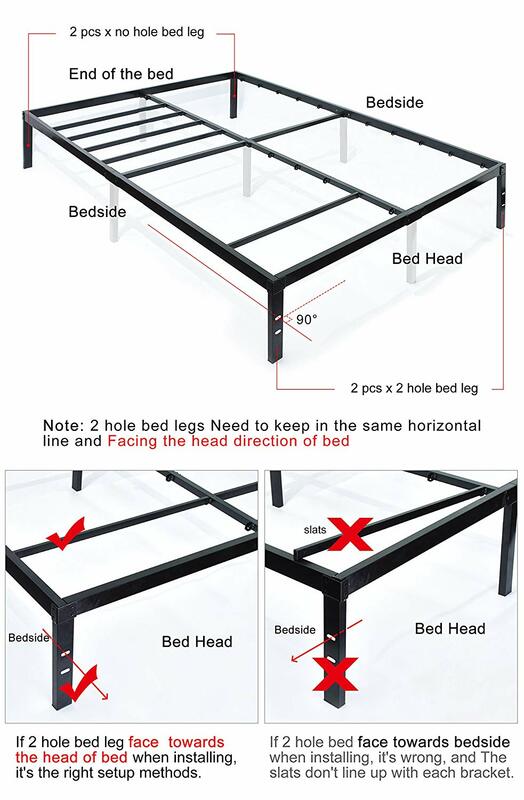 Although bed is not foldable but the main frame comes in two pieces. There are brackets to put them together. When not in use or not needed, simply remove the brackets and store it compact. Compatible with a wide range of mattresses. Note that Best Price is itself a renowned mattress manufacturer. Standing at a height of 14 inches, the under the bed storage is 13 inches which is again equal to most standard and regular bed frames. The product is delivered in compact size and weighs 66 lbs which is somewhat on the higher side. Yet, the main frame is delivered in two pieces and 7 leg units. All tools for assembly are part of the package. Best Price offers 5-Year manufacturer warranty which duration is again longest in terms of warranty. TATAGO is another proven brand name in heavy duty bed frames segment with a great rating and equally decent number of reviews. The meticulous design itself shows that the frame is built to be extremely sturdy. It is in fact the best of all the top 10 we are reviewing in terms of support and stability. It can comfortably sustain weights up to 3000 lbs. The steel slats are 2 inch (L) x 1 inch (W) x 1 inch (Thickness). Although the frame is not foldable but it is surely a space saver if at all you wish to store it at any time. The frame and main frame come independent of each other and you have simply remove the slats and store the entire pack compact. TATAGO’s sturdy construction removes the need to have additional box springs. However, if you still wish to then the frame does support. Moreover, another best feature is that the head legs come with holes to easily attach headboards. TATAGO is compatible with all types of mattresses, supports even heavier deluxe mattresses. Additionally, there is absolutely no chance of mattress slippage as well, which otherwise is a common problem with regular bed frames. With an overall height of 16 inches from the surface, the frame offers 15 inches of under the bed storage. This is again more than the usual 12 to 14 inches seen in regular frames. Although the frame is made from reinforced steel and renowned as the best heavy duty metal frame but the weight is pretty regular. It weighs just 54 lbs which is by far only slightly heavier when compared with other frames. The shipping comes with all tools needed for assembly. Yet it is neither too easy nor too difficult to put everything together for a single person. You can speed up the assembly if have some help. Nonetheless, it does not need professionals who cost extra. You can comfortably do it yourself as the package comes with an instruction manual too. The best and the longest of warranty period that any frame in the entire industry offers. TATAGO offers 8-Years warranty and free replacement of any defective parts. 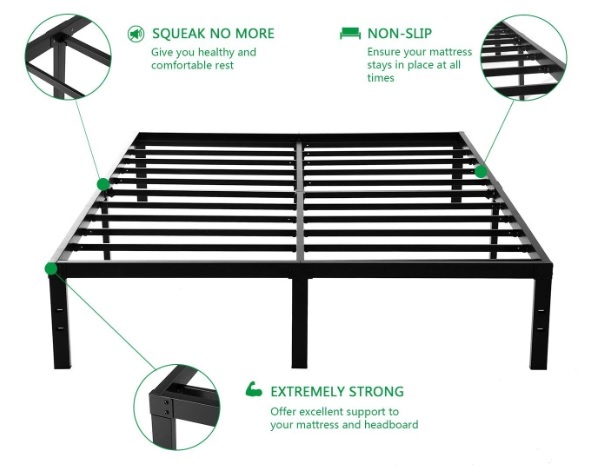 Sleeplace is another affordable regular bed frame yet proven to the core. It has an exceptional rating and hundreds of positive reviews. Owing to the single frame design, Sleeplace is not foldable in the middle. If at all you wish to store, then you have just separate the legs from the main frame. The design with 12 leg construction removes the need to have additional foundations or box springs. Sleeplace too is compatible with all types of mattresses including heavier deluxe mattresses. Sleeplace is relatively tall and stands at 18 inches. This means there is no less than 17 inches of under the bed storage space. No additional tools are required for assembly which is relatively simple and less time consuming. One person and put it together in around 1 to 2 hours time. As the frame is not foldable in the middle, the package might not be compact but it is lightweight, shipping weighing mere 50 lbs (item weight is just 45 lbs). Sleeplace too offers maximum warranty period. It comes with 5-Year limited manufacturer warranty. Although there are plenty of bed frames in the market, only a few have won customer appreciation. And the best of those few listed as the top 10 in this review. One such best bed frame is Noah Megatron. It too has significant number of reviews and a good customer rating. Made from 100% steel, the frame once assembled works noise free and as per user feedback has a capacity to sustain up to 4000 lbs weights. The frame is not foldable, the main frame comes in single piece. With as many as 9 legs, Noah Megatron doesn’t need additional box springs for support. However, if you still want the frame to suit your home decor then the head section has provisions to attach headboards. The frame is compatible with all mattress types. There are no restrictions. Additionally, the frame has raised top, bottom and side bars that perfectly hold the mattress in its place and avoid sliding or slipping of mattress. As Noah Megatron stands at 14 inches height and removing the 1 inch beam size, the frame offers 13 inch under the bed storage space. While the shipping weight is mere 50.5 lbs, the item weight too is relatively low at 48.1 lbs. The assembly process is again a key takeaway for Noah Megatron as it take no more than 20 minutes to put everything together. Like all Noah Megatron products, this bed frame too comes with standard 3-Year warranty cover. This is the only bed frame on this top 10 list that comes with wooden slates for holding the mattress while the main frame is made from steel metal. This is the most unique design among all the bed frames we have reviewed. Instead of having both steel slats and steel frame with legs, Zinus Modern Studio platform has steel frame with legs but wooden slats. It can comfortably sustain weights up to 2400 lbs. And wooden slats are relatively softer and add to mattress durability. The legs come with plastic caps so as to prevent scratches on the floor. The steel frame has foam pads so as to avoid creaky noises and the wooden slats have non-slip tapes that hold the mattress in its place without allowing it slide or slip. Yes, like majority of bed frames, even Zinus Modern bed frame too is not foldable in the middle. The steel frame is sturdy and built from heavy duty steel and needs no additional box springs or foundations. Not only the Zinus Modern Studio bed frame is compatible with all bed frames but it is also quite softer on mattress owing to the wooden slats. Hence, it adds to mattress life span. As the overall height is 14 inches, there is this standard 12 inches under the bed storage space. This 12 inch space, as per industry standards, is neither too high nor too low. 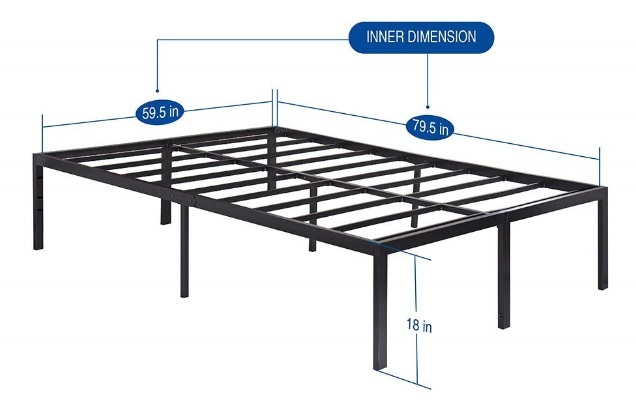 Although the shipping weight is 54 lbs but the actual frame weight is 50 lbs which is again normal and is pretty within the range of most other bed frames. The assembly process is simple and same like other bed frames and doesn’t need experts to put everything together. The units are numbered, hence, it is advised to follow the instructions in the manual for quick and perfect assembly. Like all Zinus bed frames, even its Modern Studo Platform comes with 5-Year limited warranty. Home IdealBase bed frame from Naomi is foldable and carries all the features of a heavy-duty bed frame. It too has excellent user rating and considerable number of positive customer reviews. 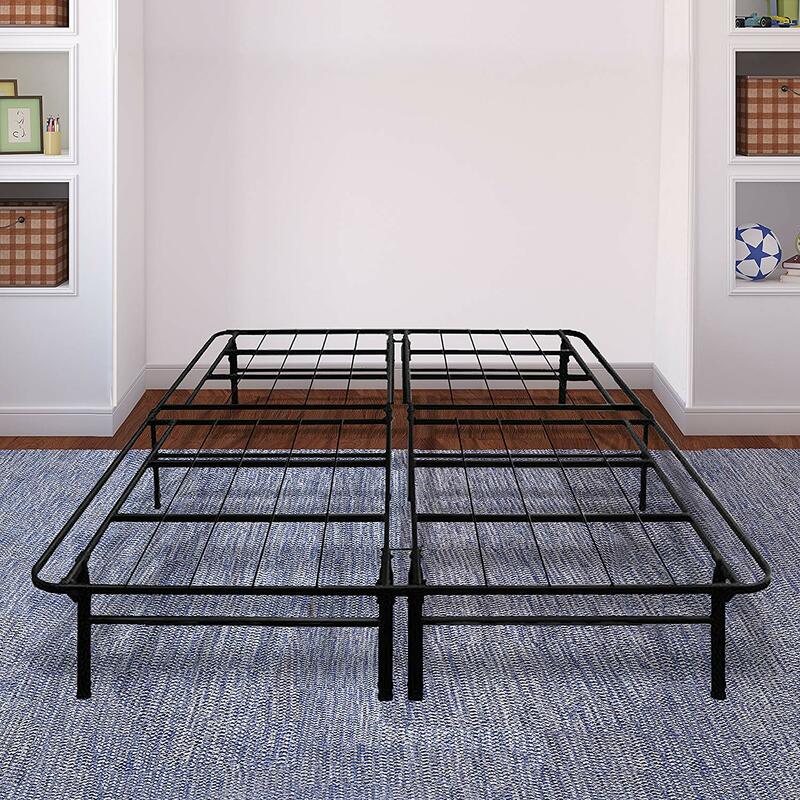 Made from heavy duty durable steel, the Naomi Home IdealBase bed frame sustains weights up to 600 lbs. However, there are support bars connecting the sides of frames’ with each leg. This design evenly distributes weights across the entire frame and also takes additional weights than the prescribed limit. The best and biggest advantage is that the frame is foldable in the middle. This ensures storing the frame is relatively easy and compact. The ergonomic design removes the need to have additional foundations or box springs. Each leg connected to sidebars adds sturdiness to the whole frame and really doesn’t require you to go with additional foundations to hold the weights. It is compatible with all mattress types. No restrictions. With a height of 14 inches, Naomi bed frame offers no less than 13 inches under the bed storage space. This is again equal to that of most bed frames. Owing the foldable mechanism the shipping is compact and weighs mere 35.6 lbs. This is lightest of all the 10 bed frames we have reviewed here. The assembly process is again tool free and can be completed within minutes. 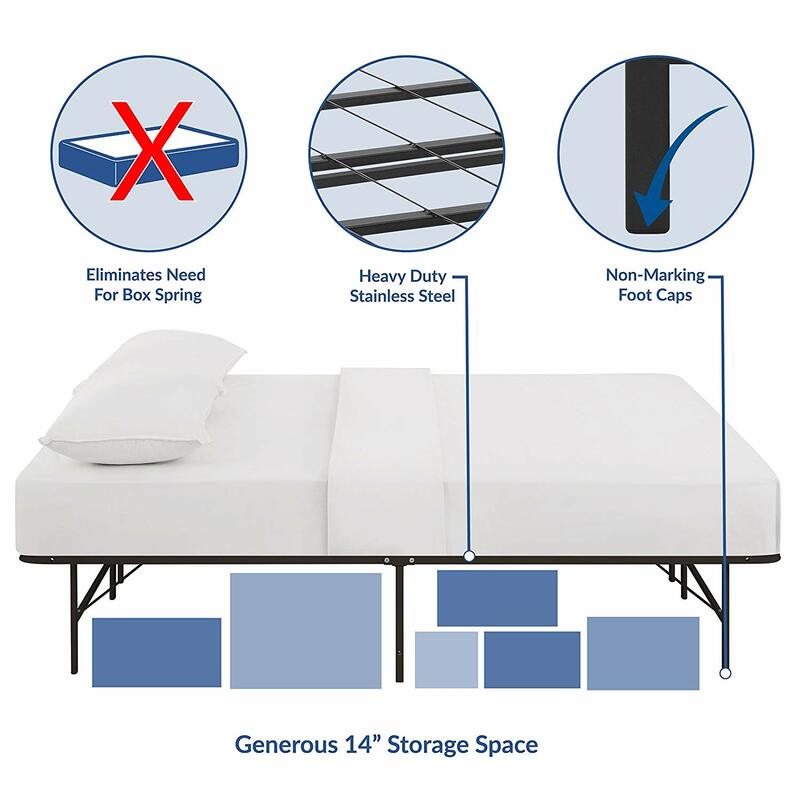 Why choose a heavy duty bed frame? No matter whether you are heavy or lightweight but the platform you sleep on is what defines your spinal health in the long run. And perhaps this is why most doctors advise people with spinal or back pain issues to sleep on the floor for quick results. But remember this is only for people who already have back issues. However, if you wish to avoid such a situation then selecting the right frame can make a tremendous difference and keep your spine in good health. Of course, the mattress you sleep on also has a role to play but the bed frame itself can be considered as primary.